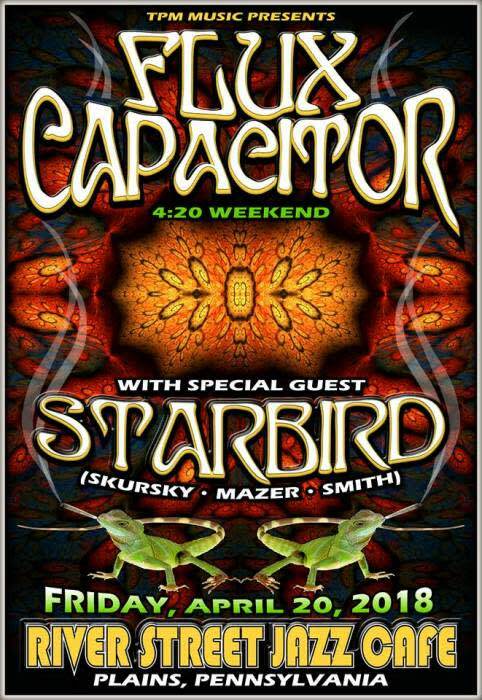 Flux Capacitor have grown tremendoulsy since the bands inception in 2007. From a hand full of shows to playing hundreds of shows, and fine tuning their craft culminating in their first full length release 2009`s "They Know We Know" and subsequent tour from Pa to Chicago Il playing 15 shows made possible through their fast growing buzz and fan-base through the internet and roots promotion. This first tour resulted in strong internet sales on iTunes and CdBaby helping to broaden their fanbase. In 2011 the brothers were invited to Seattle to work with Jack Endino for their second Release "Monolith". Following that release the band spent all of 2011 and 2012 Touring with 11 Dates throughout the UK and Canada and over 45 Shows outside their home region. 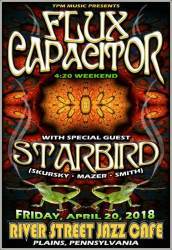 Flux Capacitor won Jam Band of the Year at the highly esteemed 2013 TriState Indie awards in Philadlephia PA and has been nominated once again for this distinction in 2014. Flux has recently released their third album "Cycle 9" showcasing the band's most ambitious and epic material to date. "Cycle 9" was recorded with John Becker of Anomoulous Audio. All three Flux Capacitor Cd's are available on iTunes, CDbaby and Bandcamp.com as well as many record stores around the east coast. Flux is a dedicated family group that believes in music, joy and consciousness. Under these guiding principles Flux Capacitor has seen nothing but growth giving killer performances and creating ecstatic dance floors at every show. "I was always singing since I was kid, walking around endlessly singing and making up songs. As I got older I got more serious and could never shake the call and the vision to be playing in a band. I had really crazy "night terrors" as a kid and I saw lots of really strange or far out stuff that really freaked me out at first. I began writing all my dreams down when I was around 13 years old and now I see them more akin to astral travel and I bring everything I see in those experiences contributes to the songs' mood and lyrics. These experiences have married me to music and my brothers, Jason (Drummer) and Mike (Keys). They have been witnesses to this creative process and have been the rhythmic core and co-creators of the music since day one." "The most important lifelong influences on me have been Jimi Hendrix and Bob Marley. I love hundreds of artists greatly but these two had a huge trans-formative effect on my growth as a performer. My eyes get wet every time I see a video of them performing and it never gets old or ceases to inspire me. As a group as a whole we were definitely inspired and influenced by Tool, Phish, Radiohead, Floyd as well as many others." "Some of my proudest accomplishments are Winning the Tri-State Indie Music awards for Jam Band of the Year 2013 in Philadelphia, there were many amazing and talented musicians nominated and it felt good to receive the recognition. Working with Grammy award winning producers Jack Endino (Nirvana) in Seattle and David Ivory (The roots) (Phila.) were exceptionally great experiences. Touring England was a huge event for us, we played 11 shows in the U.K. and we made a ton of new fans overseas. We felt so much energy from the experience playing our music on an international level. Playing the House of Blues in Atlantic City for the first time was a high point for us. As well getting to play and headline many festivals on the east coast while watching our fan base grow."